GERD (Gastro-Esophageal-Reflux Disease) occurs in 65% of patients with primary hyperparathyroidism and high calcium. Removing the parathyroid tumor cures the GERD in the majority of patients. A 51 year old male school teacher presented with fatigue, tiredness, memory loss, and GERD-typical signs and symptoms of primary hyperparathyroidism. His primary care provider was “monitoring” his blood calcium levels for over four years, and treating his low Vitamin D with high dose Vitamin D in order to “fix his calcium level.” He had nearly a dozen calcium levels checked over the period of “monitoring” and they all ranged from 10.1 to 10.9 mg/dl (Editors note: Remember, adults over 35 should have all or almost all calcium levels "in the 9's", not the 10's. And remember that it is not appropriate to "monitor" high blood calcium!). The patient is otherwise healthy except for high blood pressure and high blood cholesterol. He has had GERD symptoms for the past five or so years. Initially he was treated with ‘life style modification’ – fancy terminology that refers to avoiding eating and drinking stuff that causes heartburn, losing weight, trying not to over eat, and not eating too close to bedtime – but that didn’t help. He even rigged his bed so that the head of the bed was elevated to 30 degrees, but that didn’t stop him from having GERD symptoms – heartburn, bad breath and acid taste in the back of his mouth, sometimes pain with swallowing and pain in the lower part of the front of the chest, and occasional irritation and soreness in the throat. His doctor prescribed a medication called a proton pump inhibitor (PPI), Nexium (‘purple pill’) that helped keep these symptoms in check. He had an upper endoscopy last year with biopsy of an abnormal appearing patch of the lining of his lower esophagus, which showed Barrett’s esophagus but no evidence of cancer. Unfortunately, his doctor did not understand the relationship of high blood calcium to GERD and the fact that the GERD could be caused by the high calcium. What is GER and why do people get it? GER stands for gastro-esophageal reflux, also known as acid reflux or regurgitation. It happens when stuff in the stomach that contains acid flows back up into the esophagus. The stuff that flows back up the esophagus irritates the lining of the esophagus causing acid indigestion and heartburn. GERD is Gastro-Esophageal-Reflux-Disease. GERD is the ‘gift that keeps on giving’ – a long-lasting medical problem – gastro-esophageal reflux that occurs frequently (two or more times a week) for a long time (more than just a few weeks). It happens because the valve between the esophagus and stomach isn't working right – either is weak or doesn’t squeeze like it should, allowing acid to make its way up from the stomach into the esophagus. GERD can lead to serious health problems such as asthma and other lung problems, narrowing (stricture) of the lower esophagus making swallowing even more difficult, Barrett’s esophagus (where the lining of the lower esophagus is replaced with lining that looks like lining from the guts below), and even deadly cancer of the esophagus! Over the past few months he noted worsening fatigue and bone pain, feeling somewhat ‘down’ and ‘old’, the worst part of it was that he had troubling with reviewing and grading his students’ homework assignments – he couldn’t concentrate like he used to and it took much longer than usual for him to get through the homework assignments each night. His wife noticed that he was much more irritable than he used to be and that he had lost interest in ‘having relations’ with her. He went to see a psychiatrist for depression who checked some blood work (chemistry panel, thyroid function, parathyroid hormone level) to see if he had a ‘metabolic problem’ causing him to lose focus, lose interest in things he used to enjoy doing and be depressed. His blood tests proved he had primary hyperparathyroidism. Blood calcium was now even higher than before (11.4 mg/dl) and his parathyroid hormone level was too high (104 pg/ml where the normal range is between 14 and 65 pg/ml). He was referred to an endocrinologist who sent the patient for bone DEXA scan. The bone scan showed that he had osteoporosis. His endocrinologist explained that he had a parathyroid tumor(s) that was causing loss of calcium from his bones and that his bones were thinning and that’s why his bones were aching. The other problem that concerned the patient is that the osteoporosis placed him at risk of breaking a bone. The patient did some on line reading and discovered that his GERD symptoms may actually be caused by the parathyroid tumor and that when PPIs are used for a long time and at high doses to treat the GERD, can increase the risk of hip, spine and other bone fractures! We found a single large (3.6 x 2.2 x 1.5 cm) parathyroid tumor located deep in the right neck next to the esophagus and removed it. The other three parathyroid glands were normal (must always check the other three parathyroid glands or the patient may not be cured and their symptoms will not go away). The patient went home a few hours after the operation. I saw the patient back in follow up 6 weeks later and he was down to 2 pills per day and his blood calcium level was 9.8 mg/dl, and parathyroid hormone level was normal - 22 pg/ml. The patient said that he felt great and that he previously thought that feeling tired, irritable, disinterested, and aching as well as having difficulty concentrating was just the aging process. All of symptoms he had prior to surgery resolved. What’s more he was able to reduce is blood pressure medication in half, and he no longer needed to take his PPI because the GERD symptoms were gone. I worked closely with Drs Norman, Politz, and Lopez at the Norman Parathyroid Center to enroll several thousand patients with primary hyperparathyroidism and GERD to measure scientifically what happens to their GERD after we remove the parathyroid tumors and cure their hyperparathyroidism. Almost 60% of the 3,000 patients treated for primary hyperparathyroidism had GERD symptoms and 81% of them were taking prescription reflux medications every day for two or more years prior to enrolling in the study. We used a standardized questionnaire to evaluate GERD symptoms before and for up to two years after surgery – the Standardized Frequency Scale for Symptoms of GERD (FSSG) questionnaire. Our Findings: GERD symptoms were much improved or completely resolved for 62% of patients one year after they were cured by parathyroid surgery. This dramatic improvement in GERD symptoms can be seen in the dramatic decrease in GERD medications. Prescription medications for GERD decreased from 81% of the patients in the study down to 26% one year after removal of the parathyroid tumor(s). Nearly 40% of patients had complete relief of GERD symptoms and no longer needed to take medications for GERD. The graph below is one of 7 important graphs in our upcoming publication. The black bars shows the severity of GERD Acid Reflux in patients prior to their parathyroid surgery, and the grey bars shows the severity of GERD and acid reflux 1 year later. Note that the vast majority of people got a lot better-as indicated by the grey bars which are shifted to the left (less severe GERD symptoms). So what did we learn from the largest study done on GERD in primary hyperparathyroidism? 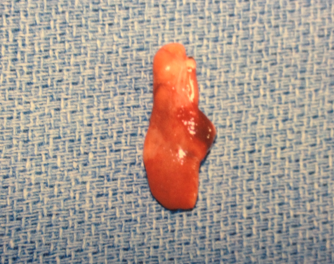 Surgical cure of the primary hyperparathyroidism [removal of parathyroid tumor(s)] provides significant, durable relief of GERD symptoms in most people. Curing the primary hyperparathyroidism enables most patients who were on prescription drugs for GERD prior to operation, to stop taking these prescription drugs after the operation. So, surgical cure of primary hyperparathyroidism is effective in reducing GERD symptoms, making this yet another reason to remove parathyroid tumor(s) in patients with primary hyperparathyroidism. The research manuscript to this important prospective study is being published later this year in a major medical journal. We will link the journal article here when published. Read more about GERD and other symptoms of high blood calcium and hyperparathyroidism. You can contact Dr Alexander Stojadinovic here. Dr. Stojadinovic is a very accomplished surgical oncologist and endocrine surgeon. He attended the United States Military Academy for his undergraduate degree and received his medical degree from the Uniformed Services University of the Health Sciences in Bethesda, Maryland. His general surgery residency was at Walter Reed Army Medical Center, them moving on to complete a Surgical Oncology fellowship at Memorial Sloan Kettering Cancer Center. Dr. Stojadinovic currently serves as a fellow and/or board member for multiple organizations including: the American Surgical Association, Society of Surgical Oncology, and the American College of Surgeons (among several others). He has received extensive peer-reviewed funding to support his research and has published 217 peer reviewed publications. Dr. Stojadinovic has recently moved to Virginia to become the Medical Director of the Bon Secours Cancer Institute. He is Professor of Surgery and Professor of Medicine at the Uniformed Services University. He currently performs surgical oncology and endocrine surgery at Bon Secours Cancer Center in Richmond, Virginia.